LNG Ltd has announced that Bear Paw Pipeline Corp. Inc. – a wholly owned subsidiary – has received approval from the Nova Scotia Utility and Review Board to build a gas pipeline from Goldboro to the proposed Bear Head LNG export plant in Point Tupper, Richmond County, Nova Scotia, Canada. LNG Ltd claims that expenditures for the 62.5 km pipeline’s construction will only begin after the financial close of the Bear Head LNG project. The Managing Director and CEO of LNG Ltd and President of Bear Paw, Greg Vesey, said: “Bear Paw’s pipeline is integral to the development of Bear Head LNG. Bear Paw would interconnect the Maritimes and Northeast Pipeline (M&NP) mainline, offshore gas, and other supplies near Goldboro, to the Bear Head LNG export plant. The pipeline between Goldboro and Point Tupper will connect Bear Head to the North American natural gas pipeline network. Vesey added: “Bear Paw and Bear Head LNG have worked and will continue to work with stakeholders and the Aboriginal community on the pipeline project and LNG facility. Liquefied Natural Gas Ltd has released a statement claiming that Bear Head LNG Corp. – a 100% owned subsidiary – has agreed to purchase an additional 72 acres of land from Nova Scotia Business Inc. 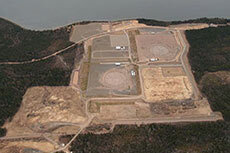 The Nova Scotia Utility and Review Board has granted LNG Ltd approval to construct the Bear Head LNG project. 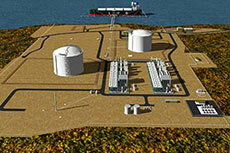 LNG Ltd’s Bear Head LNG project has filed for an export licence from the US Department of Energy (DOE). LNG Ltd has announced that the Bear Head LNG project has raised its initial facility production capacity to 8 million tpa.